On the way to Williamsburg VA with my parents we stopped for lunch in Durham at this amazing cafe I googled bakery as I adore fresh bread. 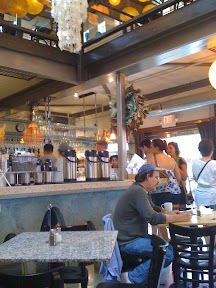 It was a vibrant and hip cafe and the food was fresh and tasty. 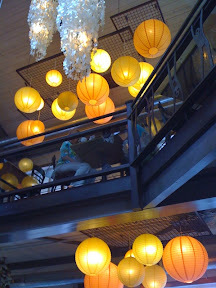 The decor was also contempory and fun Jasmine spotted some little frogs and said Wibbit!! 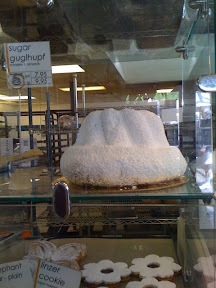 This is a guglhopf cake what the cafe is named after. 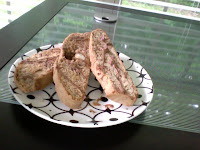 Fresh cakes and breads just like Europe I got a loaf of bread and jam for the road ! 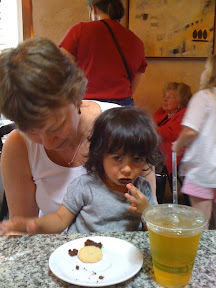 Jasmine gobbling up the nutella brownie again just had to get one of these to take away ! I think I just may have to make another detour on my way home Friday !!! 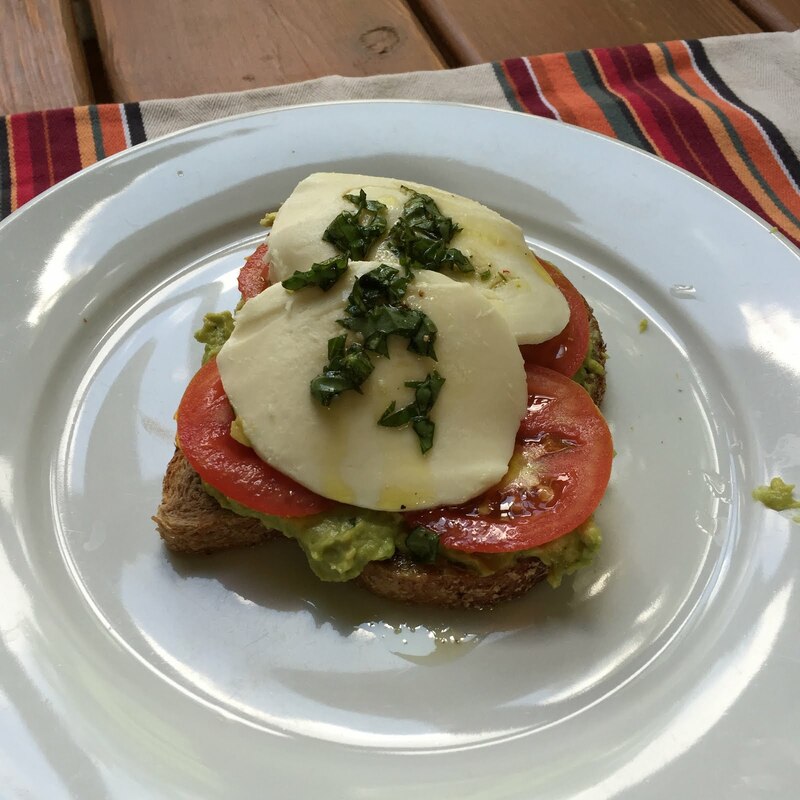 What's your favorite foodie find on a detour ? The brownies are looking good! 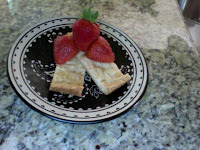 I would SO make a detour for such deliciousness. Good call. 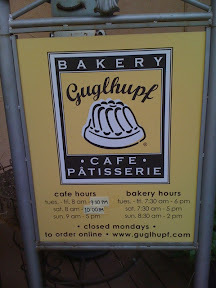 Oh..love the guglhupf cake and very nice place that I would like to visit one day. Pretty cafe! A bakery is a good idea and I also like to drop by a ice cream/ gerato shop on a detour :) Wonderful time with your parents!! looks like a super fun little place. also love the neat lighting! and nutella brownies sound a-mazing! I like to find good chips and salsa! The guglhopf cake looks amazing! Glad you are having a nice day out! 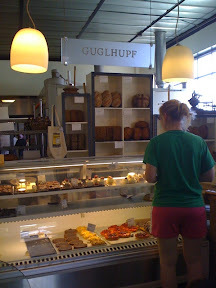 Guglhopf cafe sounds pretty awesome! Jasmine has a fine taste! Nutella brownie! 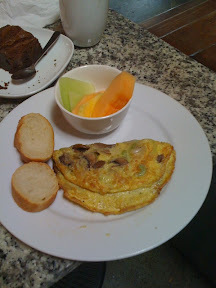 the dishes all look delicious, look like you have a great day in this nice place. Look like you had a great time at this place. Yum -that Nutella brownie looks so good! Congrats on your award. Jenn: i have a wee bit left! lucky Jasmine and that nutella brownie. Lucky you and your detour. Supremely jealous - we always stick by highways and don't do enough detours! 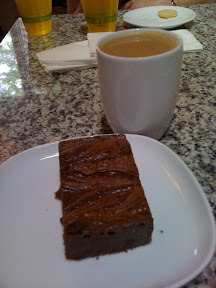 I lived in Durham several years back when my hubbie got his MBA at Duke...dont remember this bakery..must have opened a few years ago.Those brownies would have been my nightly snack!! Wow! Everything looks so good! I'll have to agree with everyone that the brownie looks delicious! Congrats on the award. 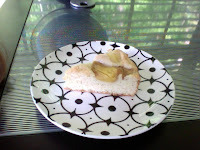 :) I love finding great bakeries - unfortunately I have only found a few bakeries that I really like in America. Do you feel the same way about American bakeries? Oh I love finding great detour places like that! Everything looked so good. Jasmine seemed to be enjoying it too! Yummy...nutella! I love finding places like this. Your little one is just so darling. Lilli: oh I need another! 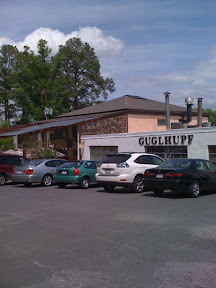 We are most proud of Guglhupf in our wonderful town. 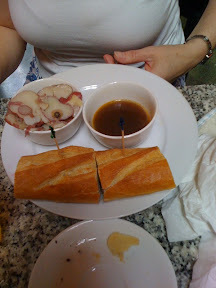 The "Gug" opened 11/98 as just the bakery and continues to evolve, now with delicious dinner service in the café. In one of your pix, Rebecca (http://lh6.ggpht.com/_wVxDEwk1QgQ/S94f87hYqGI/AAAAAAAACnM/eX2DXVdiGm0/s288/iphone_photo.jpg), it appears that you accidentally caught one of the Dukes of Duke University and 20th century industry fame--Mary Duke Biddle Trent Semans--in her usual Guglhupf spot! She's a terrific gal and another asset, like Guglhupf, to Durham. Thanks for visiting our town and come again!